CINCINNATI (AP) — A former Republican speaker of the Ohio House insisted Monday there was Democratic input during the redrawing of the state's congressional map. WASHINGTON (AP) — The former New York congressman unseated by Rep. Alexandria Ocasio-Cortez is going to work for a powerhouse lobbying firm. Squire Patton Boggs announced Tuesday that Joseph Crowley has joined its global public policy practice. Crowley chaired the House Democratic Caucus and was once considered a possible successor to House Speaker Nancy Pelosi before losing to Ocasio-Cortez in New York's Democratic congressional primary. WASHINGTON (AP) — Longtime Rep. John Dingell was remembered Thursday as "one of the greats" and "a world-class doer" as lawmakers, longtime colleagues and a former president hailed his record-breaking service in the House. DEARBORN, Mich. (AP) — A public visitation will be held in Michigan to honor John Dingell, the longest-serving member of Congress in history, who died last week at age 92. Those Democrats trying to stop California Rep. Nancy Pelosi from reclaiming the job say they don't need a rival candidate just yet. Instead, they plan to show that Pelosi lacks the votes to win the race. And then, they say, new challengers will emerge. AUSTIN, Texas (AP) — Ted Cruz is talking again about chaos in Washington, only this time he's not the one causing it. "If the next two years are nothing but a political circus of impeachment that paralyzes the federal government, that effectively locks every federal agency in gridlock, then I think we will see little to no meaningful legislation for two years," Cruz said after a recent campaign event, adding that things may devolve into "simply naked political warfare. Mad Max at Thunderdome." DES MOINES, Iowa (AP) — Former Republican House Speaker John Boehner says his party has an uphill climb in its goal to hold the majority. Boehner spoke during an impromptu press conference at the Iowa State Fair Friday. Boehner, who left office in 2015, says he would "do this a little differently," when asked about the Trump administration's tariffs on Chinese goods, as well as on steel and aluminum from allies. 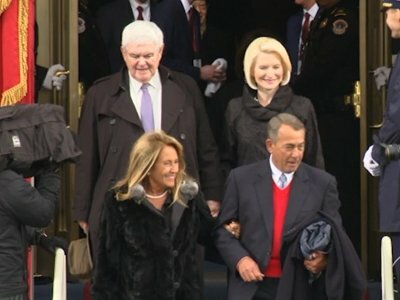 Boehner says "I always thought you caught more bees with honey than vinegar." LOS ANGELES (AP) — Former Mexico President Vicente Fox, who calls himself a soldier in the global campaign to legalize marijuana, is joining the board of directors of venerable cannabis publication High Times to advance his agenda. Speaking with The Associated Press about his views on cannabis and his new appointment, Fox said he foresees a day when a robust legal marketplace will produce new jobs and medicines while sharply reducing cartel violence in his home country. WASHINGTON (AP) — Former House Speaker John Boehner says there is no Republican Party anymore — but there is the party of President Donald Trump. Boehner was asked about the GOP Thursday at a policy conference in Michigan. He replied: "There is no Republican Party. There's a Trump Party." He added, "The Republican Party is kind of taking a nap somewhere." For the politics of pot, the times they are a-changin’. But in which direction? For some politicians, that can depend on when you ask. For example, former House Speaker John Boehner, who was “unalterably opposed” to marijuana legalization as recently as 2015, announced on Twitter last week that he is joining the weed industry and the legalization cause. No More Bong for Cheech and Chong? The pro-marijuana crowd took a hit, so to speak, Monday night when counterculture icons Cheech and Chong announced on "The Late Show with Stephen Colbert" that they'd no longer be doing "stoner comedy." It may be that the widespread acceptance of weed took the edge off that sort of comedy. Or maybe being able to buy it without having to pretend to be friends with the person selling to you took the appeal away for Cheech. For example, former House Speaker John Boehner, who was “unalterably opposed” to marijuana legalization as recently as 2015, announced in a tweet last week that he is joining the weed industry and the legalization cause. Former House Speaker John A. Boehner said Friday that despite all the "noise," President Trump is doing a good job. "If you can get past all the noise, the president is mostly doing the right things," Mr. Boehner, Ohio Republican, said on NBC News' "Today." He said that Mr. Trump has a different "style" than he did when he served in public life, but said that on issues like taxes, trade and the overall economy, the president is doing the right things. CINCINNATI (AP) — Former U.S. House Speaker John Boehner said Wednesday he has had a change of heart on marijuana and will promote its nationwide legalization as a way to help veterans and the nation's deadly opioid crisis. COLUMBUS, Ohio -- John Boehner says he's "evolved" on the issue of marijuana and will join the board of a national cannabis company that has operations in several states. The former U.S. House Speaker from Ohio and former Massachusetts governor Bill Weld announced their new roles on the board of New York-based Acreage Holdings in a joint statement Wednesday. Former House Speaker John Boehner announced Wednesday that he has joined the board of a cannabis dispensary after changing his opinion on the issue. "Over the last 10 or 15 years, the American people's attitudes have changed dramatically," Mr. Boehner said, Bloomberg reported. WASHINGTON (AP) — As badly as things have gone for immigration legislation in the Senate, it's not looking any easier in the more conservative House. That we celebrate the bipartisan budget agreement approved last week shows how far we have slipped as a democracy since President Barack Obama and House Speaker John Boehner tried to tackle our fiscal problem. It's a decline that imperils our ability to keep America great. WASHINGTON -- With President Donald Trump broaching the possibility of returning special-favor spending to Congress, an old debate is renewed. Should Congress members be able to pick priorities for their districts and then steer tax money to them? House Speaker Paul Ryan said Thursday he’s not leaving Congress anytime soon, trying to squelch rumors that he will walk away in triumph after the Republicans’ treasured tax bill is approved. WASHINGTON (AP) — House Speaker Paul Ryan is denying reports that he plans to leave Congress after the Republicans' treasured tax bill is approved. WASHINGTON (AP) — House Speaker Paul Ryan said Thursday he's not leaving Congress anytime soon, trying to squelch rumors that he will walk away in triumph after the Republicans' treasured tax bill is approved. WASHINGTON (AP) — The House Freedom Caucus has been on its best behavior these past few months. The group of about three dozen hard-right Republicans has a penchant for fighting with GOP leaders over tactics and strategy, and helped topple Speaker John Boehner, but it has played nice in the party's drive this fall to cut taxes. WASHINGTON (AP) — President Donald Trump's nominee for NASA chief is promising to run the space agency on a consensus agenda driven by science. Republican Rep. Jim Bridenstine's assurances, however, failed to placate Senate Democrats at a contentious confirmation hearing on Wednesday, with several revisiting the Oklahoma lawmaker's past statements on climate change, gays and immigrants and his brief management of a Tulsa museum that lost money during his leadership. LOS ANGELES (AP) — Country duo Florida Georgia Line and R&B artist Jason Derulo have been tapped to help country singer Hank Williams Jr.'s return to "Monday Night Football." A spokesperson for the ESPN program said Wednesday the singers will all perform "All My Rowdy Friends Are Coming Over Monday Night," a remix of Williams' single "All My Rowdy Friends Are Coming Over Tonight." NASHVILLE, Tenn. (AP) — Hank Williams Jr. is bringing his rowdy friends back to "Monday Night Football" six years after ESPN dropped the country singer for his comments about President Barack Obama. ESPN says a new version of Williams' longtime "MNF" theme and its "Are you ready for some football?" catchphrase will debut before the first regular-season Monday night game — a Sept. 11 matchup between the New Orleans Saints and Minnesota Vikings. WASHINGTON (AP) — Former House Speaker John Boehner says that aside from international affairs and foreign policy, President Donald Trump's time in office has so far been a "complete disaster." Speaking at an energy conference Thursday in Houston, Boehner praised Trump for his approach abroad and his aggressiveness in fighting Islamic State militants, according to the energy publication Rigzone. It's not the beginning of the end for the GOP's bid to repeal Obamacare -- but it might just be the end of the beginning. If House Speaker Paul Ryan manages to finally muscle through the GOP health bill on Thursday, he will temper a damaging period of false starts, soul-searching and splits in his party that tarnished the start of Donald Trump's presidency. TROY, Ohio (AP) — An Ohio town hall for the Republican who succeeded former U.S. House Speaker John Boehner (BAY'-nur) in Congress got heated as a small but vocal group reacted to his comments on issues from the Environmental Protection Agency to Planned Parenthood. The protesters were eventually forced to leave after about an hour of vocal opposition to Rep. Warren Davidson. LAS VEGAS (AP) — Former U.S. Sen. Harry Reid has accepted a fellowship at UNLV's law school. Dean Hamilton, dean of the William S. Boyd School of Law, announced Monday that Reid will become the first Distinguished Fellow in Law and Policy at the school in Las Vegas. Hamilton says it's "an unprecedented opportunity" for students to interact with and learn from one of the most prominent lawyers and policymakers in Nevada history. Idaho U.S. Rep. Raul Labrador has always been a bit of troublemaker. His involvement in the defeat of the GOP health care plan last week drew the fire of Pres. Trump who singled him out by name. SOUTH BEND, Ind. (AP) — The University of Notre Dame is giving its top award to the founder of a Los Angeles-based gang intervention, rehabilitation and re-entry program. The university announced Monday it will award the Laetare (luh-TAR'-eh) Medal to the Rev. Gregory J. Boyle of Homeboy Industries at its commencement ceremony on May 21. Homeboy Industries began in 1988 and now serves 10,000 men and women per year with services including tattoo removal and job training. WASHINGTON (AP) — With control of the White House and Senate and a commanding majority in the House, Republicans were supposed to brush off any challenge from the hardline Freedom Caucus and work their will with impunity. But something happened on the way to governing. Now, House Republican leaders are struggling with the same divisions that plagued them under President Barack Obama. LAS VEGAS (AP) — Former congressional rivals Harry Reid and John Boehner plan to co-chair a public policy think tank being proposed at the University of Nevada, Las Vegas. The institute is expected to focus on wide-ranging national and international policy issues that affect the tourism, hospitality and gambling industries, as well as the communities in which they operate. WASHINGTON (AP) — Former House Speaker John Boehner predicted on Thursday that a full repeal and replacement of "Obamacare" is "not going to happen." The Ohio Republican, who was forced out by conservatives in 2015, said he started laughing when he heard President Donald Trump and Republicans promise swift action on undoing and replacing the health law. "Republicans never ever agree on health care," Boehner said. WASHINGTON (AP) — Former President Barack Obama and Michelle Obama announced Friday they have picked the prestigious agency that represents Bill Clinton, Mia Farrow and others to handle their post-White House speaking gigs. Congressman Mike Simpson, the embodiment of the Republican congressional establishment when John Boehner was riding high in the House speaker’s chair, is the new maverick in the Idaho congressional delegation. At least when it comes to Donald Trump’s presidency. Meanwhile, Congressman Raul Labrador — the one-time bad boy of the delegation for wanting to shake up Washington and chase away the likes of Boehner from leadership — has emerged as a leader of the “new” establishment. WASHINGTON (AP) — Longtime Texas Rep. Sam Johnson announced Friday that he will retire at the end of his term. Johnson, 86, was a fighter pilot in Vietnam and Korea before his election to Congress in 1990. He spent seven years as a prisoner of war in the notorious Hanoi Hilton but returned to his hometown of Plano to a hero's welcome. WASHINGTON (AP) — Republican Rep. Mick Mulvaney, President-elect Donald Trump's choice as his budget director, is a fierce deficit hawk with a record of pushing deep spending cuts across the federal government to balance the budget. WASHINGTON (AP) — President-elect Donald Trump has tapped South Carolina GOP Rep. Mick Mulvaney as his budget director, naming a tough-on-spending conservative and an advocate of balancing the federal budget to the important post. An official on Trump's transition team, who was not authorized to speak publicly on the matter before it is officially announced, confirmed Trump's pick Friday evening. WASHINGTON (AP) — President-elect Donald Trump has chosen South Carolina congressman Mick Mulvaney as his budget director, naming a tough-on-spending conservative and an advocate of balancing the federal budget to the important post. President-elect Donald Trump has chosen South Carolina congressman Mick Mulvaney as his budget director, naming a tough-on-spending conservative and an advocate of balancing the federal budget to the important post.